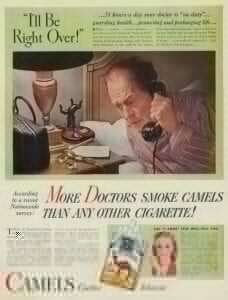 Which cigarette does your doctor recommend? The documentary is based on the book by Naomi Oreskes and Eric Conway, following the development of the tobacco industry’s public relations campaign to confuse the public, and scientists themselves, sowing doubt as the poisonous nature of their products came to light. From television commercials featuring doctors recommending their favorite brand of cigarette to tobacco CEO’s swearing on the honor of their word that “nicotine is not addictive,” the strategy was as masterful in its execution as it was deceitful of its intent. In the end, however, Big Tobacco may have won the initial battle, but it ultimately will lose the war. So it is with climate change and energy policy. The problem is that, for global warming, the stakes are even higher than the damage and loss of human lives from cigarettes and tobacco. We are quickly running out of time to effectively deal with the transition to a new, sustainable, energy economy or avert the global impacts from climate change, already underway. As long as people pay any credence to senior senators offering snow balls as proof that climate change isn’t happening, the merchants of doubt win the battle.